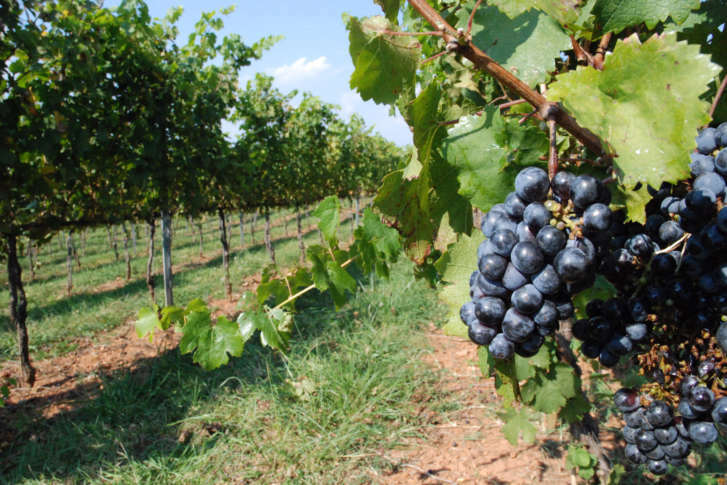 This year's deluge has posed some challenges for grapes growing in Virginia, since vines do best under dry conditions. So, how have area wineries faced all that drizzle and sizzle? Brian Roeder of Barrel Oak Winery in Delaplane, Va.
WASHINGTON — Rain that did not go away helped last month win the title of being the fourth-wettest July on record for the D.C. area. And, last May was also very wet and very hot. Brian Roeder, owner Barrel Oak Winery in Delaplane, admitted that this year has been tough overall. “The last time we really had a rough season was 2011. This probably is the second worst season we’ve had since we went into business back in 2008,” he said. Too much water brings the risk of spoilage and could affect the flavors in the grape, but Roeder said Virginia growers have best practices that drier states, such as California, may not have to follow. For starters, he said there’s “a lot more canopy management to begin with.” At his vineyard, Roeder said they’ve been working hard to reduce the amount of foliage on the vines. At Casanel Vineyards and Winery in Leesburg, winemaker and vineyard manager Katie Henley said it hasn’t been all sour grapes, even though she admitted that this year has been one of the wettest years on record for the vineyard. “All that means is we really have to be on top of things in the vineyard with sprays, and manually hedging, and making sure the fruit looks good, and it’s clean. It’s been a little troubling,” she said. Growers in Virginia “really are battling all of the elements,” Henley added. Vineyards have to watch out for the region’s humidity, which can promote mold and fungus growth, and the general amount of water that gets dumped on them. Alexandria Scadden, events coordinator at The Winery at La Grange in Haymarket, added that since grapes are largely pollinated by wind, the rain earlier in the season would wash away the pollen, which left a number of incomplete clusters. But, the Haymarket vineyard has been spraying for mold and mildew issues, and also has a canopy management plan. Henley echoes the sentiment. “The big hope is that it dries up,” she said. And though temptation is there to bring in fruit from out of state, Henley said part of her vineyard’s ethos is to rely fully on Virginia fruit. “We also purchase fruit from neighboring vineyards in the area. So my wines, my vintages, are very indicative of the land here in Virginia,” she said. Henley’s goal continues to be making wines that are unique to Virginia. “Creating a Virginia wine is a unique opportunity to show the world that yes, it’s tough to grow here on the East Coast,” she said. “But, when everything clicks, and there’s dryness, and not as much humidity, years like 2010, 2007, 2014, you can make some really beautifully expressive wines that do stand up nationally and internationally,” Henley added. “This is not going to be a great year for Virginia wine,” Roeder said, but added that those who already know how to make good wines will be able to make good wines. It’s just that great wines may not be in the forecast this year. Katie Henley of Casanel Vineyards and Winery in Leesburg, Va.